This paper is the first in a four-part series examines the ways that wireless technology and mobile communications can enhance the efficiency and quality of institutional healthcare, improving the processes through which doctors, nurses, specialists and support staff members deliver medical treatment. Part One offers an overview of the current healthcare situation and suggests ways in which wireless technology solutions address healthcare challenges. 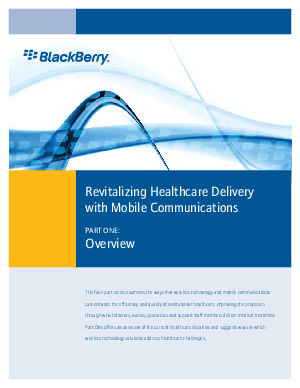 Some important questions for healthcare organizations that are addressed in this paper include: * Can several communications functions be consolidated into a single device? * What are the unique requirements of different user groups in the organization? * How will the use of this new technology impact existing workflows? * How can wireless devices increase adoption of electronic health records (EHR)?